Compared to last year, the traffic almost doubled, and now I get around 270K page views and over 130K visitors on a monthly basis. Overall, in these five years, I got over 5 million page views and 2.7 million visitors. Cool, right? 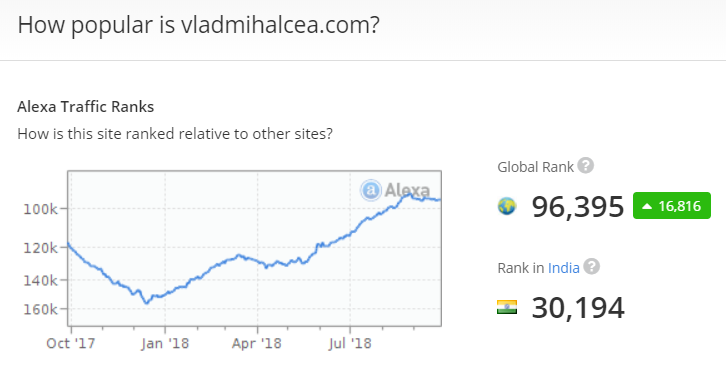 After 5 years of blogging, I’m really proud that my website managed to get in the Top 100K websites according to Alexa. All this time, my strategy was to publish one article per week because, when it comes to blogging, quality is more important than quantity. After several months of writing, in 2013, the traffic numbers were really low, and at some point, I thought of abandoning this project and focusing on something else. However, the feedback from the community was good, so I decided to keep on going. All in all, getting good traffic takes time, so if you’re starting a blog, you must be patient and persistent. Not only it allows you to improve your English skills (in case you are not a native speaker), but it will also help you express your ideas succinctly, which is an underrated skill. After blogging regularly, writing documentation will not be a daunting task anymore, and you will be better prepared for this job, so keep that in mind. In November 2017, I became a Java Champion, and this blog has contributed significantly to this achievement. When I started blogging, I never imagined that, in the end, it would have such a big impact on my life. In fact, 3 years ago, I quit my day job to focus on my blog, book, training and courses, and eventually, I also managed to join the Hibernate development team. After 5 years, I can tell that starting my blog and deciding to allocate more time for it have been some of the best decisions I took for my career. In 2018, I managed to publish my first video course. Although it’s a very time-consuming process, I like the end result. 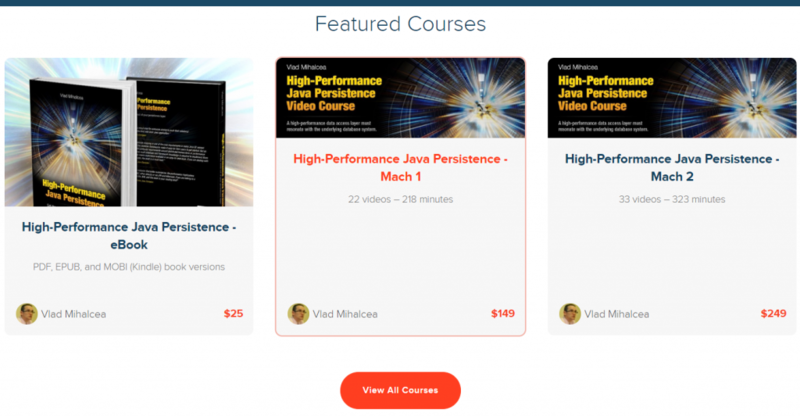 One of the main advantages of having this video course is that I can reach a larger audience that I could have done with the on-site training alone. I’m still working on it and looking forward to releasing the Mach 3 and 4 series. Afterward, I will start working on a new video course. At the end of September 2017, I decided to create the hibernate-types project which aims to offer a great variety of custom Hibernate Types to handle JSON, ARRAY or database-specific Enum column types. This project simplifies the creation of custom Hibernate Types via its ImmutableType. 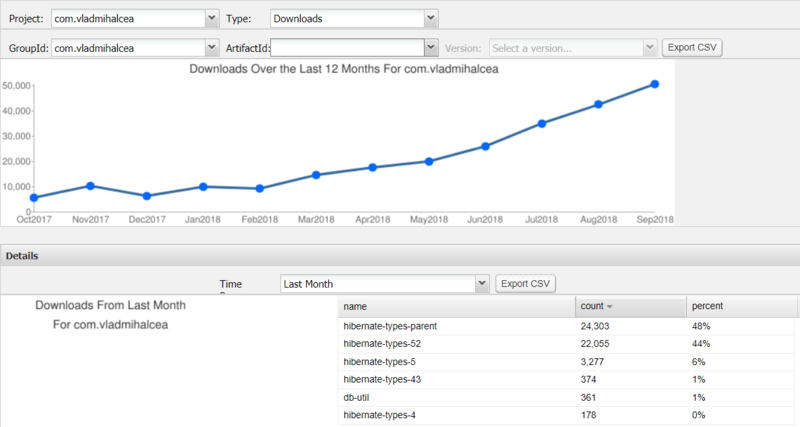 After one year, the hibernate-types projects gets 50000 downloads on a monthly basis, meaning that it’s been a very useful project for many developers. and I gave a workshop at Craft Conf in Budapest and another one at JDK IO in Copenhagen. In October 2018, I’m looking forward to speaking at Voxxed Days Cluj-Napoca. Check out my presentations page if you want to watch the recordings from some of these conferences. Thank you for reading my blog and stay tuned for more!